I was teaching physical education at Hamilton Hill High when the Principal asked me to take on a Year 8 class with minimal maths, reading and writing. I was young and silly enough to say "yes". I set about teaching the students what they would need in order to survive, things like filling out a tax return. I would take them outside for physical activities and then we'd discuss what we'd done and write it on the board. I had accidentally hit upon a good strategy; the language experience approach to teaching reading, developed in the '60s and '70s. Moving to Darwin I worked as a remedial reading teacher and set up a reading centre where I helped five children at a time for six weeks with reading difficulties. I ran the centre for about seven years; it was like a research lab for me. It was wonderful to see the children progressing. Everything went from there. Over the last 40 years, as a teacher educator, I have worked to develop teachers' understanding of how children learn to become literate. I developed the Spelling and Writing Continua for First Steps for the Department of Education, WA. These are now used in the USA, UK, Canada and New Zealand. 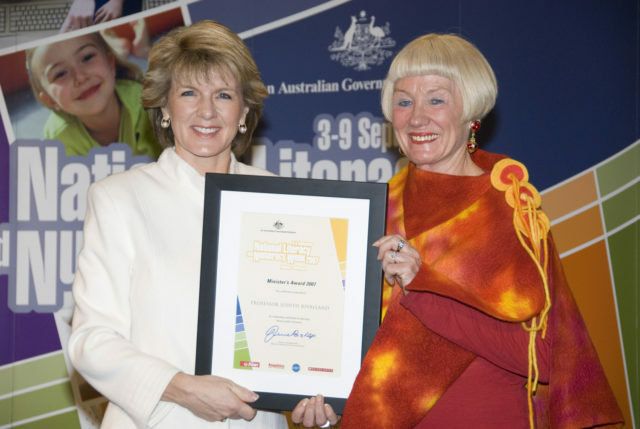 I am also proud of the National Literacy Research Projects in which I was involved and the establishment of the Fogarty Learning and Research Centre at Edith Cowan University to conduct research in to literacy teaching and learning difficulties. It was satisfying to receive some awards at the end of my career, including the Minister's National Literacy and Numeracy Award (2007). But I think my greatest achievement is to have reached the position of Professor while bringing up three children as a single parent and coping with chronic fatigue. My advice to others is don't be afraid of trying new things. Persevere, as it is not always the brightest people in the world who succeed; it is often the most tenacious. One lovely memory was when after winning the Slazenger Cup for the first time in about 40 years, the teachers were so pleased with us that they served us breakfast in bed!